Still In Denver, But The Countdown Has Begun! Wow! It's really been a whole month since my last post. We're still in Denver getting things wrapped up here. The repairs to the basement are coming to a point where they're stable enough that we can soon leave it and head back to St. Louis for a few days, then back to Why Knot, which has been comfortably waiting for us in North Myrtle Beach. The whole basement thing here has been a pain in the neck! Lisa warned me that there's a difference between how contractors out here approach a project compared to how they act in St. Louis. In St. Louis contractors move with a chop-chop attitude, moving quickly and aggressively to win the contract, get to work, and get it done. Not so out in Denver. There is a much more relaxed attitude about it. Saying it was laid back would be an understatement. They make boaters hanging around on their boats in a marina on a warm summer day look like a bunch of hyper go-getters. But the work is progressing. The major stuff is done or within a week of being done. There are a few things that are going to be deferred until we get back out here in October. Getting the carpeting down is the biggest of these. We're just not happy with the selection and quality of what's available. We have an idea of what we want the entire finished project to look like, but we can't seem to figure out what kind of carpeting fits our ideal. The most involved aspect of the whole project has been the very large bathroom that has had to be completely redone from the waterline to the top of the radar dome. Everything! We've really gone all out to turn it into something very cool. We've actually had a bent in our minds to make it look like a dock. The tiles we chose have a wood plank kind of look and it looks really cool. It's going to be awesome. A little marine vibe in Colorado. We're at the point in everything that we felt it was safe to start the clock, so to speak, to leave Denver. We've booked our flights back to St. Louis for April 15th. Yay! We'll hang out in St. Louis for a few days, maybe a week, when we'll then rent a car, load it up, and head back east to South Carolina. Once there we will wait for several weeks for Rick and Margi of Journey to make their way up there. They will be crossing their wake at Barefoot Marina and we're looking forward to help them celebrate finishing their Great Loop adventure. Hey, by the way, Jim and Dale of Sweet Pea! When you read this, give us a call. We need to talk. My despair has gotten so bad that "Ain't No Sunshine When She's Gone" or some other appropriately sad song is playing on a continuous loop in my brain. Sometimes the theme song from The Addams Family works its way in there, sometimes it's Dixie Chicken by Little Feat, occasionally that banana song by Harry Belafonte, but most of the time it's "Ain't No Sunshine When She's Gone." Ah, here it is now - "I know, I know, I know, I know, I know..."
Hi all! It has been a month since my last post. There is a lot to talk about. First, the new news that's good news. I have published a book about our first two years out on Why Knot, and I am very excited about it. It's called Our On Board Life, A Love Story About Two Rookie Boaters Living the Dream, Loving the Lifestyle, and Learning Everything From Scratch. It's available as a Kindle ebook (with formats that will work on any device) and a softcover book. I wanted to make sure it was available as an ebook for those of you out on the water unable to get a delivery easily. The ebook is easily available wherever you are. 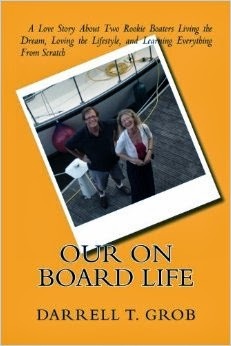 As I wrote and rewrote it several times I realized that this was not just a book about boating, but a book about how Lisa and I fell in love with our life on Why Knot. It is also about how we grew deeper and deeper in love with each other and with the entire boating lifestyle. I also wanted it not to be a travelogue or cruising guide, but a book about many of the subjective aspects of doing what we have done. For instance, there are several chapters that a wannabee looper or boater will find interesting. There are some chapters that I have never seen covered in any other books, too. In one chapter I dip my toes into marina marketing. But there's lots in it for experienced boaters. I hope you all will check it out. It's available exclusively on Amazon.com. Click here to go directly to the book's selling page. The other news? Well, if you remember when we were at out house in St. Louis, we had to contend with some serious issues with mold in our basement. So much so that we had to buy an entire truck load of dirt to re-landscape our yard to make rain water run away from the house more actively. We also had to replace flooring and drywall. It was a mess, but we got it done and headed out to Denver for the months of February and March, our normal spring shore leave. So, here we are in beautiful Denver. The weather here has been typical; lots of snow that melts quickly in the warm sunshine of the frontrange. Everything was going great. Let me set the stage. There are two houses here next to each other - a small comfortable bungalow that we live in, and the larger ranch-style house that belonged to Lisa's family. One morning we were leaving to run some and errands. I got into the truck that we have here and Lisa went to her parent's house just to do a quick look-see. As I was sitting in the truck Lisa came out to where I could see her. She was waving her arms frantically to get my attention. When I noticed her she darted back out of sight back to her folk's house. This was a bad sign. As I entered the house I could hear a whooshing sound that was totally out of place. It came from the finished lower level. As I rounded the staircase downward I could see standing water. I found Lisa in one of the bathrooms and could see that a pipe enclosed in drywall had burst and was spraying out of a hole that it made in the drywall. It was jetting against the opposite wall so intensely that it gouged a hole in that wall too. The water had been spraying for at least 24 hours and about three inches of water had accumulated everywhere. Fortunately, due to the layout of the basement, all of this water was confined to one end of the basement; about a quarter of the house's entire foot print. (There is a large drain in one corner that kept it from getting worse.) I found the water main and turned it off. But the water had made its way all over and all of the drywall had soaked it up. It was all damaged. Now, remember that we had a mold problem in St. Louis? Well, the problem we have in Denver is that the texture compound used on the drywall is laced with asbestos. We went from mold to asbestos. That means that to repair it you just can rip the drywall out. It requires hazardous waste abatement. That means a totally sealed and contained environment. The workers have to wear haz-mat suites. It's a big frikkn' deal. But the work is underway. As I sit here on Saturday, March 1st, the abatement people will wrap up their work today. Then our repair contractor will come in on Monday and start his thing. It's a major pain in the stern, but it all is scheduled to be complete by the third week of March. That means that we will be able to keep our schedule to get back to the boat sometime during the first week of April. If there is an upside of this episode it is that we were here when it happened. We feel fortunate about that.